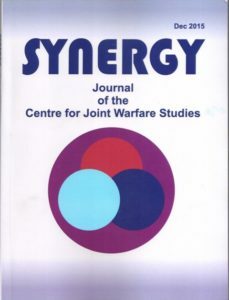 Synergy: Journal of the Center for Joint Warfare Studies, December 2015, pp. 45-62. Currently about 60% of India’s defence equipment is procured from abroad. There are imminent risks of such a situation to India’s national security as seen during the 1965, 1971 Indo-Pak Wars and 1999 Kargil conflict. The success of the “Make in India” programme is critical to increase the share of defence equipment produced within the country. International arms suppliers are however unlikely to undertake complete transfer of technology especially in critical materials and technologies. The article argues that in the long term, there is no alternative to strengthening domestic defence research and development (R&D) if the larger objective of increasing self-reliance in defence has to be met. The article flags three bottlenecks which need to be done away with in order to strengthen India’s domestic R&D efforts. These include adequate long-term funding for research & development; augmentation of national capacity and capability to support R&D efforts; and compressing development timelines and ensuring quicker induction of the platform into the Services in large numbers.